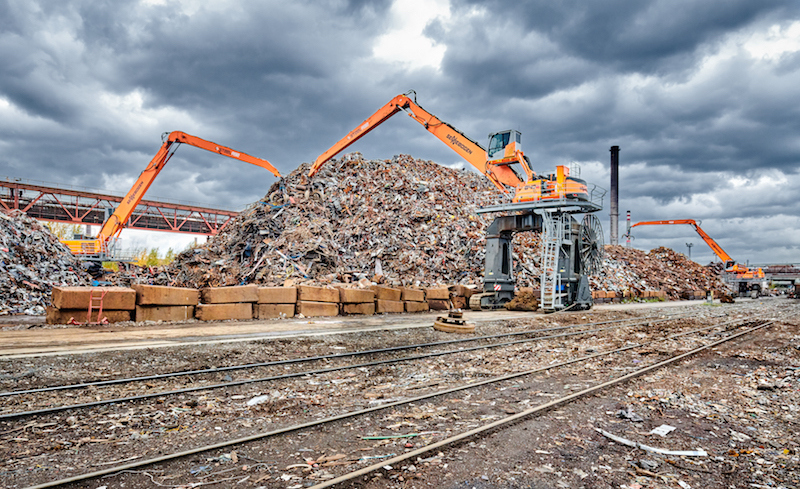 The SENNEBOGEN E-Series machines really stand out among the huge scrap heaps. They have been a permanent fixture at mill service specialists STEELAGE since the beginning of 2018. STEELAGE has been operating at Ostrava, the largest steelworks in the Czech Republic, for some 5 years. Inside the works, which employs around 7,000 people and has been at the heart of the third largest Czech town since the 1950s, Steelage is indispensable as an internal scrap logistics expert, handling on average 120,000 tons a month, and doing so, from the start, exclusively with SENNEBOGEN material handlers. Innovation, safety and a reliable partner - that is what is important to owner of Steelage, Jörgen Sassen. "We have been working with SENNEBOGEN for a few years now, we were looking for the perfect balance in terms of price and performance that just did not seem to be on offer in the market." They finally found the ideal service and support partner in dealer Merimex, who guarantee reliable, customer-focused support. Those in charge of the project faced an interesting challenge thanks to the difficult space restrictions. The central scrapyard is surrounded by narrow pathways and two sets of railroad tracks, across which the scrap has to be transported. At the same time, they need to be able to easily load transport wagons and unload delivery trucks. By working closely with dealer Merimex, a unique, customized solution was configured from the modular SENNEBOGEN range. A flexible 840 crawler gantry excavator powered via a spiral winding engine line drum is used, meaning that trucks can drive under the material handlers without interrupting their workflow. With a reach of up to 23 meters, a strengthened special attachment is in operation. This has to stand up to the enormous continuous load of, on average, 6,000 operating hours a year. In the center of the front section of the 20,000 m² yard, there is currently another stationary 825 electric solution that feeds a compactor and is soon to be replaced by the next largest machine, the 830. Three further 840 crawler excavators, with electric drive and 2 m pylon extension, drive between the wagons and the storage area. The extension guarantees the driver the best possible view of the scrap heap and for loading wagons. "As we are involved in recycling the steelworks' old scrap, it was clear that, for cost reasons, we could only operate electric machines. Also, we are aware of our growing responsibility towards our employees and the environment and going forward we want to reduce our fine dust and noise pollution," says Sassen about the investment at the 70-person site. Steelage sees this as an advantage over larger competitors in the market where diesel machines are still seen as the undisputed standard.